Planning a visit to the Penn Museum of Archaeology and Anthropology and want to get the lowdown on some of the must-see objects in its collection before you go? Almost able to remember a stray fact from an exhibition you saw back when you were a student at Penn that you’re convinced could really pull together your middle-schooler’s social-studies project on Ancient Civilizations? Curious about what Guangzhou (Canton), China looked like in 1930, or what was going on in 1960 with the Museum’s excavations in Tikal, Guatemala? You can find all that and much more—from a grainy Kinescope recording of the Museum’s 1950s-era TV show What in the World?, to the latest entries in the Museum’s ongoing “Great Beasts of Legend” lecture series—at the newly launched Digital Penn Museum ( www.penn.museum/collections ). 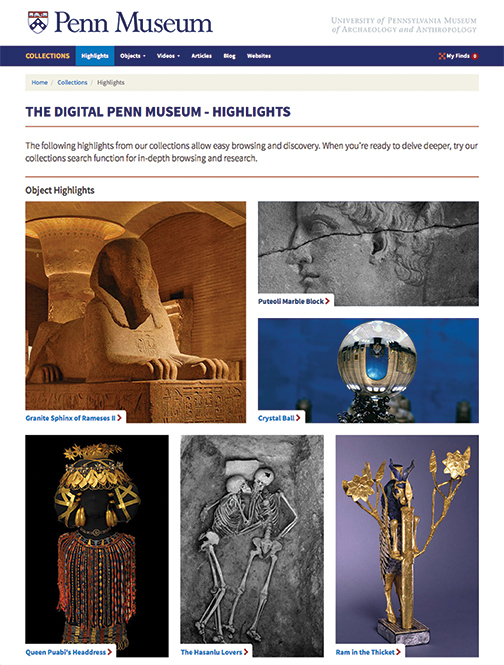 While the Museum has had an online presence since the 1990s and has been working on digitizing its holdings for the better part of the past decade, the new portal brings together all the resources available in an elegant, user-friendly package that serves the casual visitor and deep-diving scholar alike. The site offers a curated selection of highlights from the Museum’s collection, like the famed Granite Sphinx of Ramses II that presides over the Lower Egyptian Gallery [“Gazetteer,” Nov|Dec 2015] and the intertwined skeletons of the “Hasanlu Lovers,” as well as other treasures organized by geographic region. But visitors can also search the collections database of nearly 900,000 objects and more than 180,000 images, as well as follow links to 1,100 archival films, videotaped lectures, and other educational programming. More information is provided by articles digitized from the Museum’s magazine, Expedition, going back to its founding in 1958, and some 800 blog posts from Museum staff and Penn students. Finally, the project has also preserved and upgraded more than 40 “legacy” websites encompassing content from the Museum’s online exhibits, the online content of past physical exhibits going back to the late 1990s, various international research projects, and interactive sites that allow visitors to write their names in cuneiform or hieroglyphics.